My family skillet cookies! 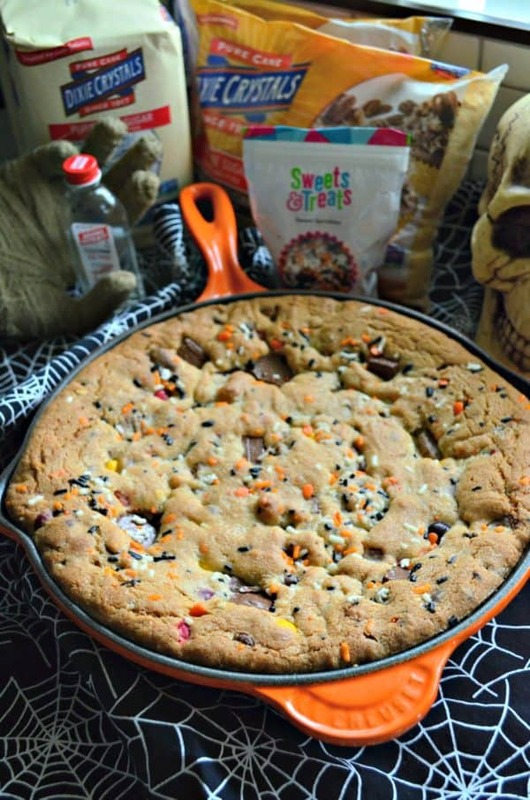 When I started brainstorming Halloween themed recipes I knew I had to make a Halloween Candy Skillet Cookie. This is the absolute best way to use up at least 2-3 handfuls of chocolate. 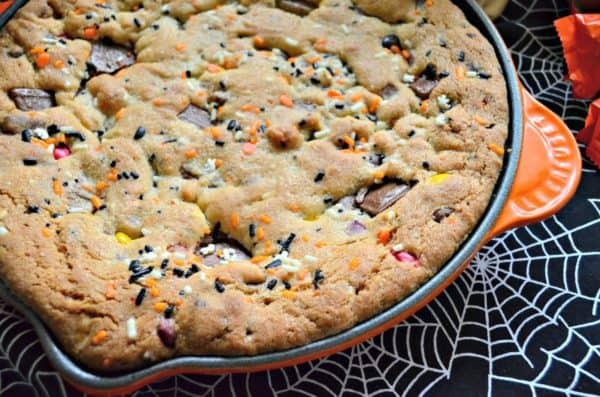 I used a similar method to my Halloween Candy Cookies, but in the skillet form and added the oh-so cute Sweets & Treats Sweet Sprinkles Mix: Haunted House mix into my cookie. Because let’s face it–sprinkles make everything so much better. 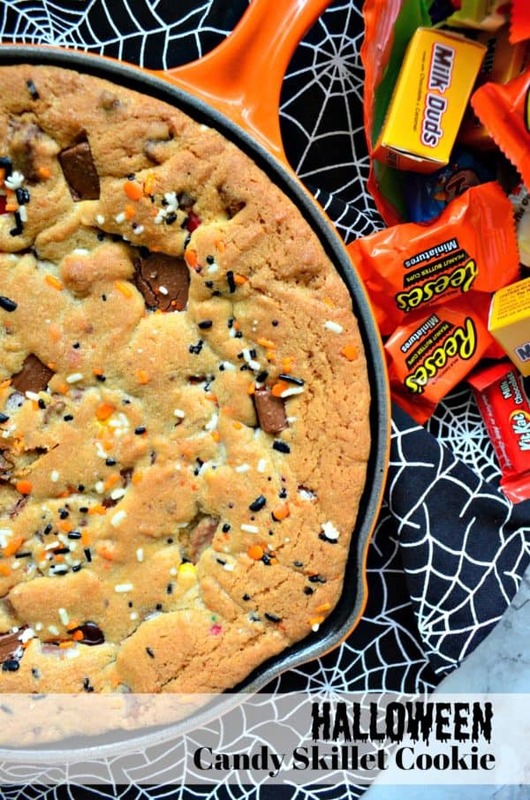 What candy do you use for a Halloween skillet cookie? I like to use whatever my child brings home; however, I am strategic in the flavor pairings. I know my kids don’t like coconut so I don’t put any almond joys in the skillet. Nor do I put any peanut m&m’s for choking reasons. But honestly… the sky is the limit. Here is what I put in my cookie skillet. You start a skillet cookie the same way you make traditional cookies. I use a KitchenAid Stand Mixer fitted with a paddle attachment and cream together the Dixie Crystals Brown Sugar and Granulated Sugar with salted butter. Most people use unsalted butter for cookies but I prefer salted. 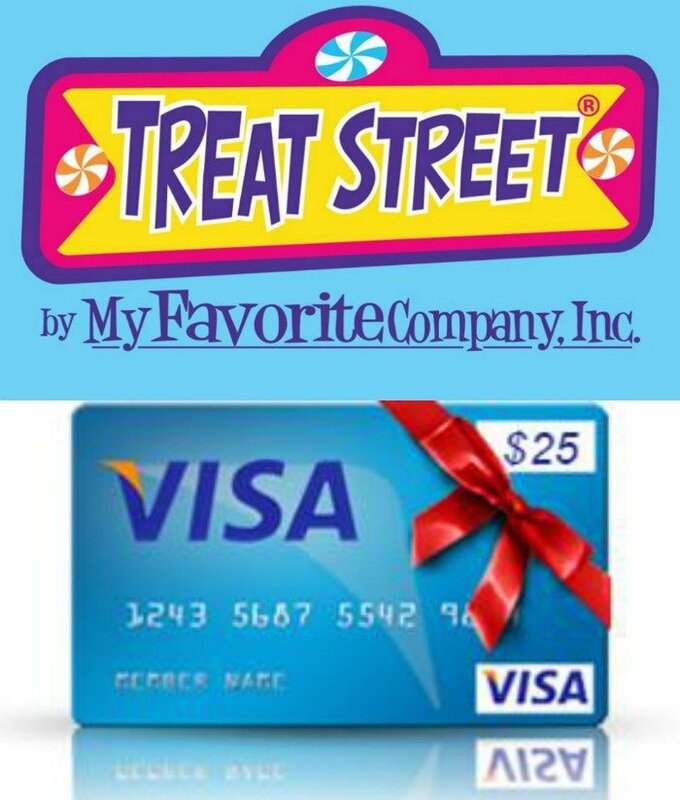 It’s what my mom always used, so it’s what I use. 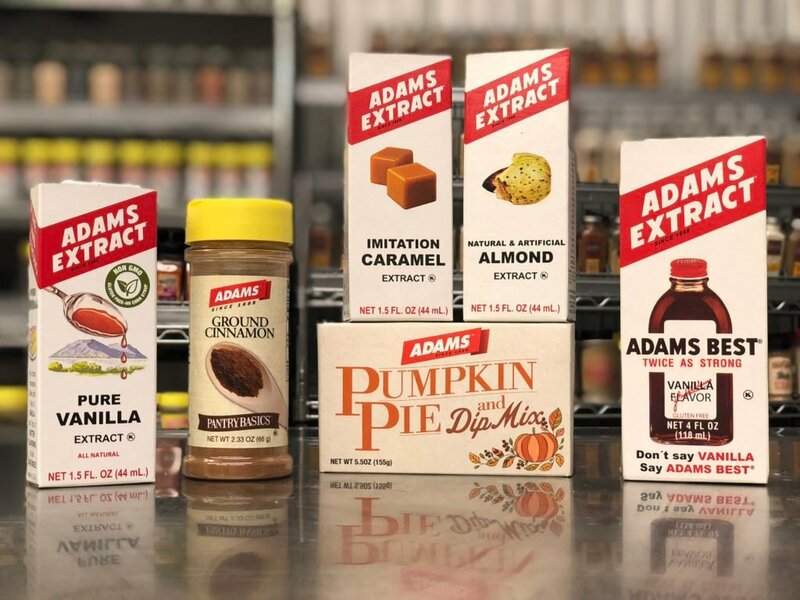 I love using Adams Extract ClearVan; however, since it’s a cookie and brown in color you don’t have to use clear you can use traditional Vanilla Extract. I just love the Adams Brand. After you’ve mixed all of your wet ingredients together, you’ll start to add in the flour. Lastly all the chopped chocolate candies. 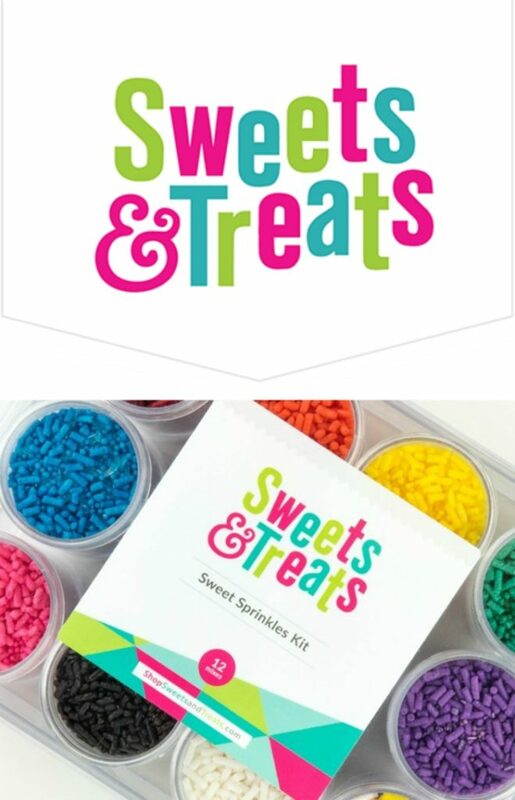 The last 5 seconds of mixing I add in the sprinkles. Before placing the batter in the skillet. I grease the skillet one last time with vegetable oil. Then wipe it clean with a paper towel. 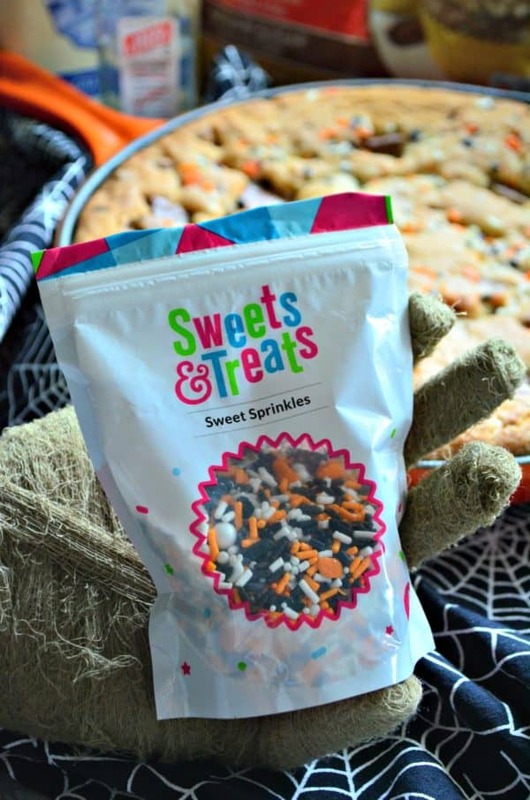 Pat down the batter then I sprinkle Sweets & Treats Sweet Sprinkles Mix: Haunted House sprinkles on top of the cookie batter. They will bake right into the top of the cookie. 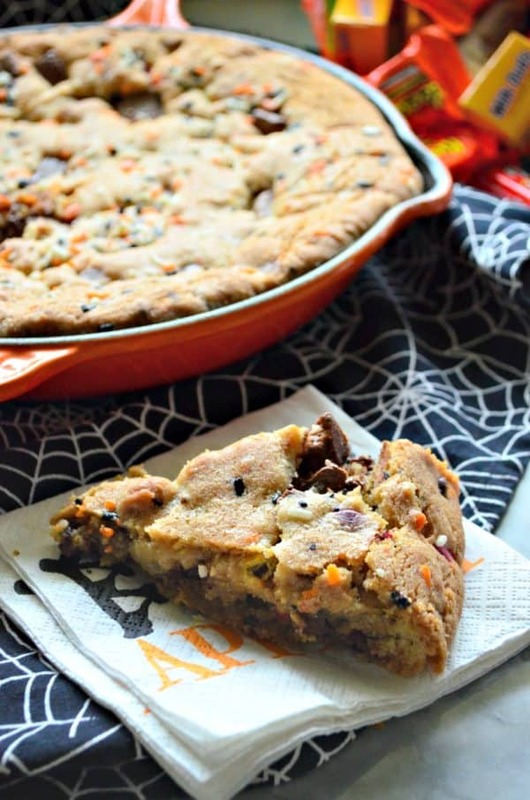 So if your looking at another way to use up all that leftover Halloween candy and you don’t want to make individual cookies–the skillet cookie is the way to go! Using a stand mixer fitted with a paddle attachment; beat the room temperature butter, Dixie Crystals Granulated Sugar and Dixie Crystals Light Brown Sugar together for 1 minute on medium speed until creamy. Then add in the eggs, Adams Extract Clear Vanilla, and baking soda. Mix again for 3o seconds. Add the all-purpose flour to the mixture, and mix on low for 20 seconds then medium speed for 40 seconds until well incorporated. Stop the mixer, add in the chocolate chips, chopped chocolate Halloween candy, m&m's and 2 tablespoons of the sprinkles. Mix on low for 10-15 seconds until just incorporated. Grease a 9-inch cast-iron skillet with vegetable oil. Wipe it clean so it's just greased but not puddling. Then scoop the cookie batter into the skillet. Flatten with a silicone spatula and sprinkle the remaining 1 tablespoon of sprinkles on top of the cookie. Bake for 30 minutes until golden brown. Carefully, remove the skillet from the oven and let rest in skillet for 30 minutes. Cut into wedges, and serve. Notes: *If you don't have a stand mixer, you can use a handheld mixer. 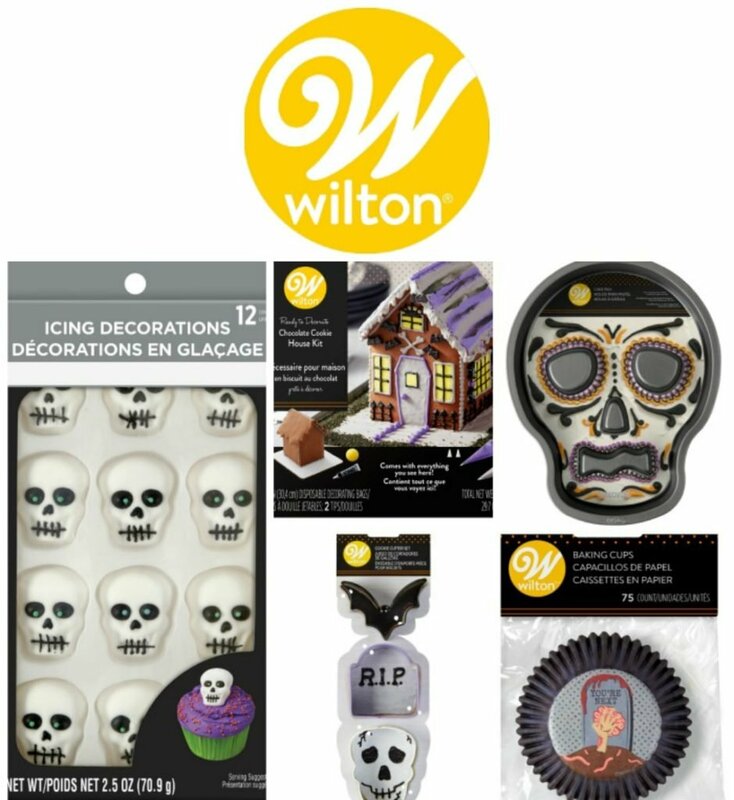 **You can use whatever chocolate Halloween candy you have on hand. Pumpkin doughnuts are my favorite. 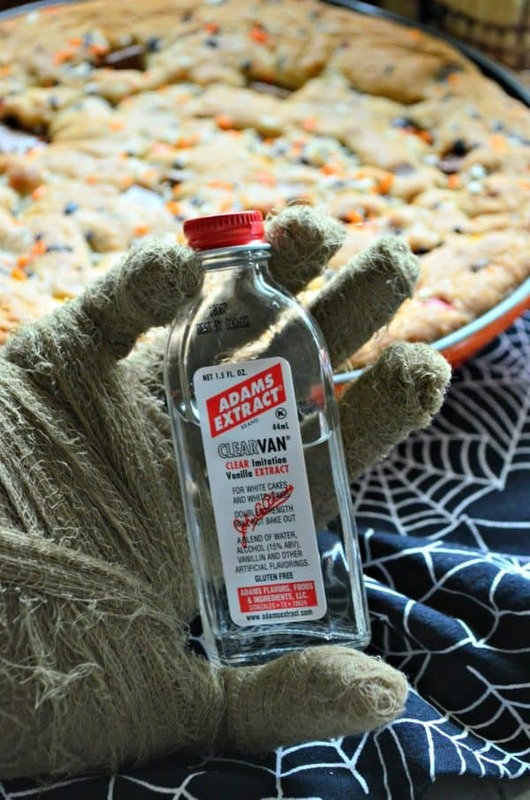 Pingback: The Crypt Keeper Cocktail #HalloweenTreatsWeek - Who Needs A Cape?